Menulog delivers for Mia's Cronulla so you'll be able to track your courier on a map. Smokey salted German bread with butter. Crumbed calamari rings with aioli. Cheese Kransky, chips with curry sauce. Cheese Kransky, sauerkraut with curry ketchup or mustard. Sliced smoked pork with sauerkraut. Pork knuckle served with creamy mash potato and sauerkraut. Viennese style veal schnitzel served with chips and garden salad. Viennese style freshly crumbed pork fillet served with chips and garden salad. 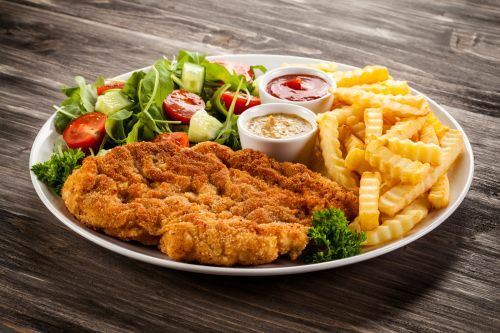 Chicken schnitzel served with chips and garden salad..
A selection of traditional Cheese Kransky, German Thüringer & Nürnberger Bratwurst served with creamy Mash Potato and Sauerkraut. Smoked BBQ pork ribs, BBQ chicken wings, pulled pork, mixed sausages, served with coleslaw, pickles and jalapenos. Pork knuckle, mixed sausages, leberkase, chicken schnitzel, creamy mash potato, sauerkraut, garden salad and chips. Bucket of wings with smokey BBQ sauce. Lebanese eggplant, kalamata olives, grilled halloumi cheese, chargrilled capsicum, cherry tomatoes, mixed leaves, basil, and balsamic vinegar. Mixed salad leaves, bacon, boiled egg, parmesan cheese, croutons, tossed in traditional caesar dressing served with chicken or prawns (please choose). Roasted pumpkin and baby beetroot, fresh oregano, mexed leaves and sliced pork filet. Beer battered flathead and hand-cut calamari served with chips and aioli. Pork baby-back ribs. Served with chips. Smoked beef patty, aged cheddar cheese, lettuce, pickles, herb and garlic sauce. Wagyu beef patty, red cabbage coleslaw, caramelized onions, mixed leaves, cheddar cheese, BBQ sauce. Leberkase, fried egg, cheese, coleslaw, curry sauce. Grilled chicken strips, grilled pineapple, crispy bacon, tomato, lettuce, Mia's chef's sauce. Chicken schnitzel, tomato lettuce, Mia's chef's sauce. Fried fish, grilled prawns, calamari rings, rocket, chilli lime aioli. Halloumi cheese, pickled cucumber salad, wild rocket, balsamic glaze.